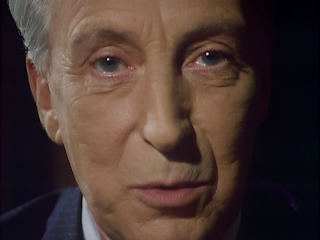 In the first series, House of Cards, Francis Urquhart was slicing and dicing up the government as he seen fit with no resistance. No one knew he was doing it. He was Chief Whip and was able to work from behind the scenes to get what he wanted done. He used people through blackmail and eventually became a murderer. Yet with all of this, only two people knew the entire truth. His wife and Mattie Storin. Mattie was killed by Urquhart at the end of House of Cards yet one huge piece of evidence existed and that was the tape recorder Mattie kept on her at all times. Even on that fateful afternoon when she confronted Francis Urquhart on the garden rooftop of the House of Commons she had the tape rolling. There he admitted to what had been going on but there is also threw her off the roof to her death. The tape recorder survived and now is with someone……..waiting to divulge its existence. This episode starts off with the Prime Minister getting ready for a party or something else. He is putting on his suit and he starts having more flashbacks to Mattie’s death. Her free-falling through the air and landing on a car below, crushing the car roof with her body. His terror is interrupted by his wife Elizabeth. She asks if he is ready and they go to the reception. It’s not a party per se although there are a lot of people in attendance. These are the people of Urquhart’s government, Urquhart supporters, and Sarah Harding. Remember Sarah? She was sought out by Elizabeth because she thought Francis needed a challenge. Sarah is very intelligent and will be a great asset to Urquhart’s team of advisors and she is also extremely attractive. Urquhart’s announcement is simply that is he going to hold a general election. 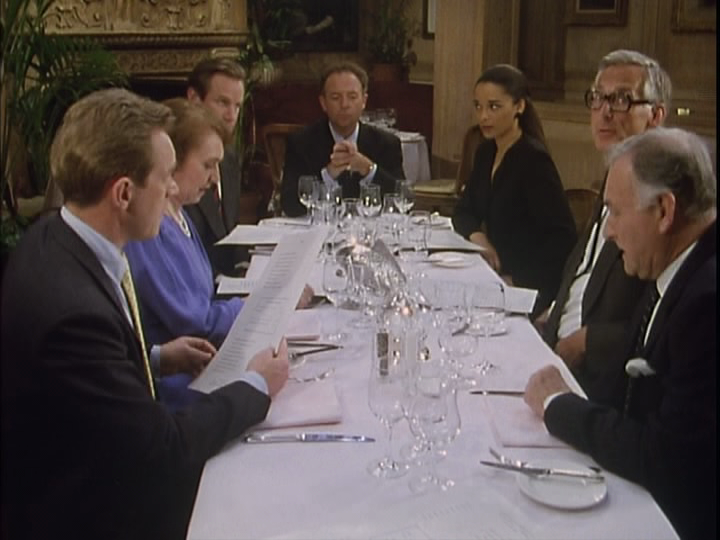 Though how the idea was presented by him to his guests was that His Majesty the King is talking out of turn about the government and it was too much for Urquhart who was prepared to resign over it but instead decided the best course of action is to have a general election. What makes this irresistible to Francis is that he has an unfair advantage over any opponent. It is very unlikely he could lose. He starts bringing in people closest to him to start discussing the roles they will play. One person who is kept waiting is Sarah Harding. Finally after Urquhart has met with everyone, he seeks out Sarah. He visits her in her room at Chequers. She is furious that she was given short notice to attend this announcement and then she is kept waiting for hours to speak with him. 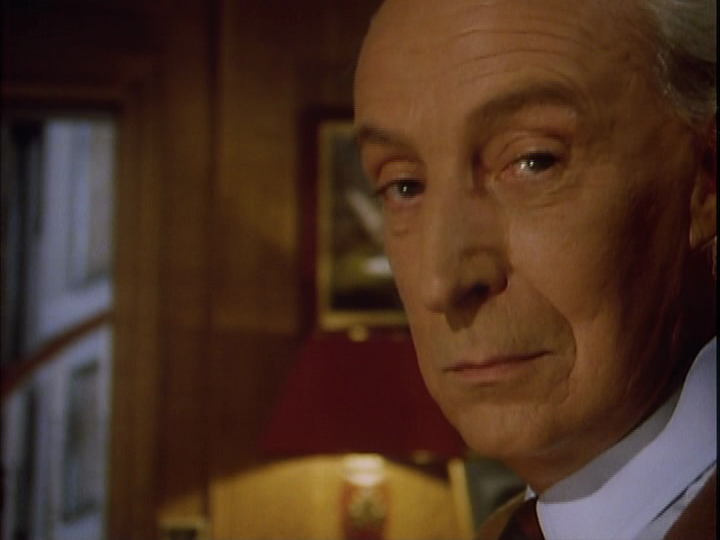 In the room, she is given the full scope of the ambition of Francis Urquhart. He is willing to destroy the King or have him abdicate the throne if he does not fall in line. Even though it looks like Sarah takes it at face value, it is clear that Francis is more malevolent about what he wants to do. Sometimes it’s hard to remember that Francis Urquhart is a villain. Just like in House of Cards, Francis will speak directly to us, the viewer, and some of the stuff he says is humourous and insightful. Then we see what Urquhart is capable of doing. One minute he might be giving us background on the way something in government works but the next he says something like he is angry at the King and wants to harm him. 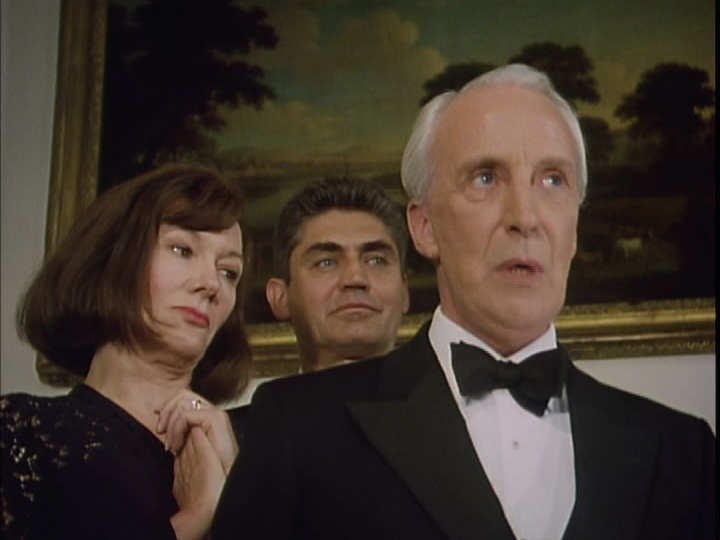 Upon hearing from Elizabeth that Tim Stamper may see himself as the successor to Francis Urquhart as Prime Minister, Urquhart remarks, “You know, I can’t see anyone succeeding me.” Even with it being fictional, it is actually kind of scary as someone sees themselves as the absolute ruler and they think they have absolute power. At Buckingham Palace, the feeling is much different. The King has put together a dinner party with key members of both political parties in attendance. The King’s goal, so he says, is to get better political debate going again. There is more to it, as the King is eager to get support to get Urquhart to listen to him about his grievances or force Urquhart to resign. The dinner gets interrupted very quickly. It’s hard to trust anyone in this series and as I have not seen this before nor have I seen the final two parts of this series yet, it’s hard to know if what I am watching is linear or I am watching what the director wants me to see which may not be quite as linear. For example, Mattie Storin plays heavily into everything but in whose favour? Last week, I thought it was Penny Guy who had Mattie’s tape recorder. That was a silly thought and it is clear to see why it wasn’t her. This week, we start to get a better perspective. Tim Stamper has been very loyal to Francis Urquhart. He was extremely loyal in House of Cards and has been very loyal so far yet he is unhappy with how he is getting treated. For the upcoming general election, Stamper has been asked to be party chairman and run Urquhart’s campaign. In this series he has been nothing but a heavy for Urquhart. Last week, he arranged a strange agreement with Princess Charlotte so she can be “friendly” with Sir Bruce Bullerby whom she can’t stand. This week, Stamper is blackmailing Gropeham to make sure his paper is supporting Urquhart and not the King. If Gropeham doesn’t do this, information will come out about his indecent exposure charge from 15 years earlier. Stamper is tired of being thought of only being good for blackmailing other people. Finally, after being loyal to Urquhart, it appears that Urquhart is letting Sarah closer into his confidence than Stamper. So it is obvious to assume that we can start associating the following incidents to Stamper. After Stamper is brushed aside on one occasion by Urquhart, we see Stamper thinking about something very important and we cut to a scene inside a vault. Inside we cut to the same safe deposit box we saw last week and a gloved hand retrieving the most-important tape recorder. The man is in the car carefully stroking it with his figure as it is a very prized possession. 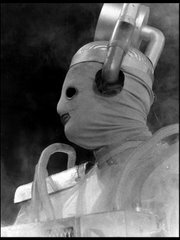 Later in the episode something more disturbing happens. Stamper has a bad telephone conversation with Urquhart. Once again, Urquhart is brushing Stamper aside, not answering his questions about when the general election is going to take place and also is being very secretive about everything else going on. Once Stamper gets off the phone with Urquhart, he thinks for a moment, he then picks up the phone again to make another telephone call. We cut to Sarah walking down a street and is accosted by a group of people. They take her purse and look through it but not for money. They make sure they that this is Sarah Harding. Once they realize it, one of the gang, a woman says to Sarah, “Ask him about Mattie Storin.” Of course, they mean ask the Prime Minister. They then rough her up a little and run off. Clearly both acts are orchestrated by Tim Stamper, right? Wrong. Like I mentioned before, I have not seen the other episodes so everything I am saying is a guess. I think I am being duped. Things we are being presented here are not exactly as they seem and this is my theory. I do not believe it is Stamper who has the tape recorder. The order of events are as follows: Stamper is annoyed and Urquhart tells Sarah that he needs to see her immediately. Someone goes into the safe deposit box, gets the tape recorder. We see this person in the car looking at the recorder and drives off. I believe this person is driving off to get Sarah and bring her to Urquhart. This person is Corder. I believe Corder is the one with the tape recorder. Is he acting alone? That I do not know. Now as for the other point, I will get to that in a second. This episode is much more of a set up for things to come. There are a lot of individual elements that are contributing to this episode but as of yet are not that related. There are a lot of pieces that have just started and need to be addressed and I wonder how they will play out for the rest of the story. Obviously the King is going to wage some kind of battle over Urquhart. It is unclear yet what that is. The Chief of Staff for Buckingham Palace David Mycroft has a new life. After years of being married it looks like he is being honest with himself and found a boyfriend. The problem is that in such a high ranking role for the crown plus the close friendship he shares with the King could be a problem for him and the crown. Princess Charlotte is doing well on her arrangement of allowing Sir Bruce Bullerby into her life. After a day of fox hunting she invites him up to her room and helps her take a bath. Bullerby is a fumbling fool and it is clear that the Princess can’t stand him but she is doing what she has been told to do. Unfortunately for her, she is being eavesdropped on from outside of their castle. Compliment of the Prime Minister Francis Urquhart. If that’s not enough we even get a scene with a prostitute played by Emma Bunton also known as Baby Spice from the Spice Girls. It’s a shame she had to lower herself to play that role….of course I mean the role of Baby Spice! As for Sarah being attacked in the street and told to ask Urquhart about Mattie, I think this is really interesting. 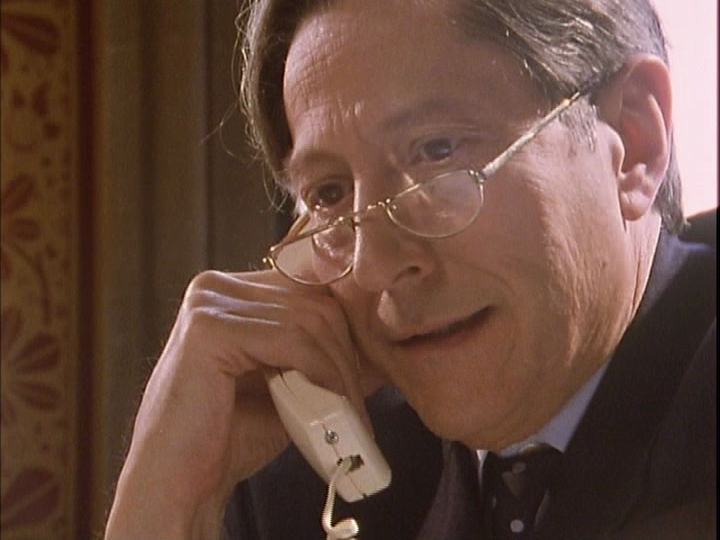 Once again we see Stamper, who is frustrated with Urquhart, pick up the phone to possibly arrange something. We cut to the scene where Sarah is attacked. I do not believe Stamper is responsible for this either. The next scene is Sarah explaining what just happened to her to Urquhart. He doesn’t seem very concerned that someone would tell her to ask about Mattie. In fact, he is quite open to letting her know the truth. Except his recollection of events is much further from the truth. In his story, Mattie is overly emotional over their affair breaking up. In his version, she follows him to the House of Commons roof garden and jumps off forcing him to see it. Bringing Sarah into his confidence works for him, Sarah has pity for him and wants to have an affair with him. The look he gives the camera after she seduces him and leaves the room is priceless. Was all of this arranged by Urquhart himself? There is so much more that is left to be resolved, luckily there are still two episodes left to go. 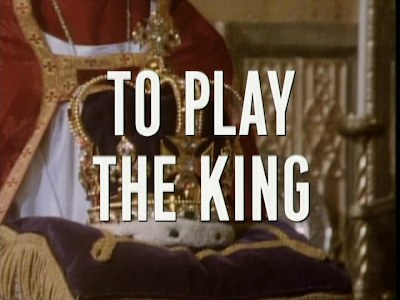 Next week: The third installment of To Play the King.